WD 4 series Self-Propelled Windrowers offer gains in efficiency and unparalleled flexibility in mowing options. Whether you’re cutting your crop or your customers’ crops – you need to get a lot done in a tight time frame. 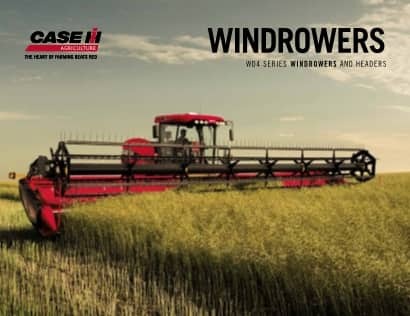 The performance of Case IH WD 4 Series Windrowers starts with the most powerful engine and largest disc header available in the industry and extends to many other innovative, efficiency-improving features. The end result? An unmatched system that allows you to move faster through the field and cut more... all day, every day. The smooth ride from the independent rear axle suspension lets you drive faster, increasing cutting speed, and allows you to get more done in a day. Ideal for high-speed operating conditions – as when running a disc header – this suspension system also provides added protection for your windrower by reducing shock load to the chassis. Single Cast Tail Wheel reduces dirt build up in muddy conditions improving performance. Perfect for cutting on terraces or borders, the Case IH WD1904 and WD2304 feature industry-exclusive independent lift arm flotation for the header. Adjustable from the cab, separate hydraulic systems for the left- and right-sides of the machine effectively work as a tilt allowing you to tailor the cut to the terrain on the go. Looking for a comfortable, modern cab that offers many features? The cab on the WD 4 Series Windrower is for you. It offers industry-leading visibility with intuitive controls like the ergonomically-correct Multi-Function Propulsion lever, also used in the CASE IH Axial-Flow® combines. The standard features will impress you – and the optional features will amaze you. WD1904 and WD2304 incorporate a new Multi-Function Handle. The new handle is similar in shape and size but offers the following key benefits: Ergonomically enhanced for increased operator productivity and comfort and resume button for header raise and lower. Here’s a perfect fit: the adjustable air suspension seat and ride suspension sensor adjusts to suit any operator and provides greater comfort and optimal control. Optional cab suspension and the suspended rear axle promise to provide a smooth ride over the roughest terrain, leaving you less fatigued at the day’s end. The fact remains; a windrower is only as good as its header. Case IH has you covered. New Case IH RD 3 Series Rotary Disc Headers are designed for customers who demand high quality, nutrient rich hay, greater productivity, decreased operating costs, and reduced downtime. Disc headers are available in 16ft and 19ft widths with chevron intermeshing rubber or steel conditioning systems. Two heavy-duty knives on each disc on the rotary disc headers spin at 2,500 rpm to slice through heavy, tangled crops. Knives are reversible for twice the cutting life. Not only do the RD 3 series rotary discs feature wider discs than the previous RD 2 series, but they are also equipped with even stronger components such as wider gears and larger cross shafts that are lubed to prevent wear. Discs are austempered for extra hardness and durability in punishing conditions and the protective liner in the hood helps reduce rock damage. Modular cutterbar design features self-contained oil reservoirs with individual dipsticks which make fluid checks easy, eliminate cross contamination across the cutter bar and ensure maximum lubrication on inclines. The full-length auger provides optimal feeding from the cutterbar into the conditioning rolls. Engineered with a positive feed design, the auger more effectively moves crop toward the center of the conditioning rolls for more even windrow formation. These innovative CaseIH headers are engineered to combine greater productivity with reduced power consumption. Farm operations come in all types and sizes; so do headers for WD 4 Series Windrowers. The HDX 2 Series sicklebar headers offer an appropriate size for any customer who requires high quality cut hay, while the DH2 Series draper headers are ideal for windrowing crops including canola, wheat, barley, flax and forage. Whichever is best for you, the cost-effective productivity of Case IH intuitive innovation stands ready to work for you. HDX sicklebar headers are available in 14ft, 16ft or 18ft widths. Draper heads are available in 25ft or 30ft widths. For quality hay-harvesting results, team an HDX sicklebar header with one of the WD 4 self-propelled windrowers. Treat your hay to the smooth cutting and gentle handling of the Case IH sicklebar headers. HDX sicklebar headers use the counter-stroking action of dual sickles to shear crop cleanly, while the unique floating auger keeps the crop moving smoothly to the conditioning rolls. Bolt-on knife sections are standard on all sicklebar models for easy field replacement if necessary. These over-serrated knife sections provide long life and a cleaner cut in most crop conditions. Double heat-treated range guards offer long life in tough conditions and superior resistance to rock damage. When the crop is ready and the weather is cooperating – downtime is not an option. And when you’re cutting, efficiency and productivity are pivotal. That’s why Case IH WD 4 Series Windrowers make servicing simple, with quick, and easy and on-the-go productivity-enhancing features ensure you’ll be making the most of your in-field time. In-cab productivity features like the hydraulic header flotation system allow you to make adjustments on the fly, quickly responding to changing ground contours. You also can change header tilt from the cab with hydraulic cutterbar angle adjustment. With this feature, guard angle is adjustable from 6 to 12 degrees below horizontal for sicklebar headers, and 2 to 10 degrees below horizontal for disc headers. WD 4 Series Windrowers can quickly adapt to sickle, draper or rotary disc heads in about 30 minutes, no tools required – and, no need to buy a different machine just to run a draper head to cut your small grains crop. And if you have to transport, the quick-attach couplers make it simple and easy to detach the head. Keeping your WD 4 Series Windrower hard at work in the field is easier than ever before. For one thing, the fuel fill can be easily reached from the ground. No more climbing up steps, dragging hoses across the machine to fill the tank. And with a fuel capacity of 120 gallons (454 liters), you can work all day long. Side shields flip up for easy access to the engine. From ground level, you easily can reach all key maintenance points, including fluid levels and filters. And the fuses are located behind a panel inside the cab – a clean environment that protects them from corrosion.